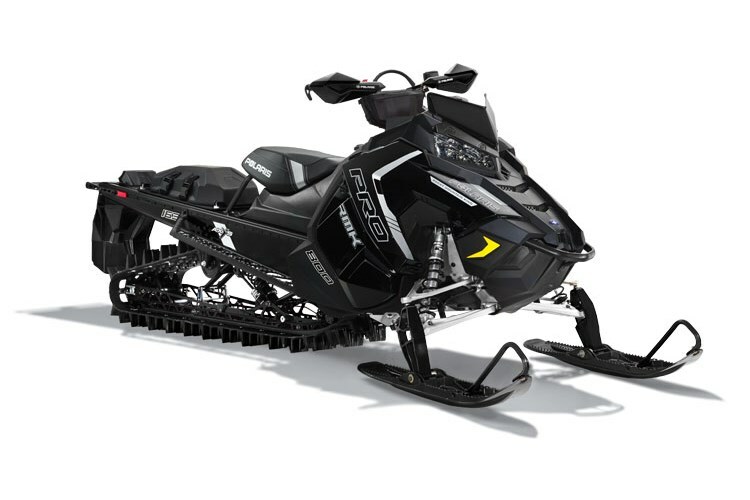 2016 Polaris 800 PRO-RMK® 163 3"
Proven 800 Cleanfire® H.O. Engine Developed in conjunction with the AXYS platform, the proven 800 Cleanfire® H.O. Engine delivers +10% increase in power-to-weight ratio and quicker throttle response to generate instantaneous lift. The integrated mounting position optimizes the balance of the chassis. Featuring: - Grooved piston for improved durability and engine life - 3-stage electronically-controlled exhaust valves for increased power and responsiveness - Electronic oil pump for reduced throttle effort and improved durability - Thermostat with bypass warms up to operating temperature 40% faster and improves durability - High-efficiency intake and exhaust for improved breathability, which increases power - Exclusive VForce Reeds for more power and improved reed life Lightweight crankshaft that's more durable, 2.5 lbs lighter and has 25% less inertia This is the same 800 H.O. engine released with great success in the 2015 Polaris RUSH and Switchback models, and has been proven through 100,000+ field testing miles. Series 7 3.0" Track The all-new Polaris exclusive Series 7 3.0" Track is the ideal track to provide lift in the deepest, softest snow conditions. Features a new lightweight single-ply design optimized for weight and powder snow performance. Chaincase Drive System The PRO-RMK with the 3" Series 7 track uses Polaris' tried and true chaincase drive system, which has a 12% lower gear ratio necessary to deliver the optimal performance for the 3" track. Walker Evans® Shocks During SnowCheck, there is a choice of a premium Walker Evans® Piggyback Clicker shock or the Walker Evans® Monotube Shocks. The new Walker Evans® Piggyback Clicker Shocks with compression adjusters and remote reservoirs offers the best performance across the broadest range of conditions. The new Walker Evans® Monotube Impact-Extruded Shocks are the lightest weight shock option from Polaris for those riders counting ounces. The one-piece, simple design is lightweight yet durable. Polaris Interactive Digital Display Another industry first for Polaris - the most advanced instrumentation in snowmobiling. This 4.3" high resolution, full color, LCD digital display provides a rider with information including: - Sled performance: Speedometer, tachometer, dual tripmeters, & odometer - Sled operating conditions: Fuel level, coolant temperature, diagnostics & maintenance warnings - Riding conditions: Time of day, Day/Night mode - Bluetooth™ functionality: Enables the display to communicate with the rider’s cell phone and provide notification of incoming calls or texts. Battery, signal strength. - GPS / Mapping Capability: A compass and full-featured GPS comes standard when the GPS receiver is installed. Latitude, longitude, and elevation are displayed, along with the ability to mark and save waypoints and tracks. - Vehicle Immobilizer and security function allow you to lock your vehicle with a passcode. - Software can be upgraded during the life of the vehicle, so your display will never become outdated. Screen options can be customized to suit rider preferences. This display is an option for SnowCheck Select 2016 and is also available as an accessory option for all AXYS® models as well as PRO-RIDE™ models when used with the accessory Defrost Bag.